I first enlisted the services of Jeff Bergman after I took the SAT for the first time, in the fall of my junior year. My score was already relatively high, but I had a feeling I could do better if I had some assistance. Jeff quickly recognized my weaknesses, which mainly resided in my lack of familiarity with the test and practice with actual test questions. After identifying these problem areas easily within the first few minutes of our first session, Jeff was able to lay out a customized program that was not only sensible and comprehensive, but also seemed manageable. After working with Jeff a few more times, I felt infinitely more comfortable with the test, and actually enjoyed plowing through the myriad questions. The second time I took the SAT, in the spring of my junior year, I went in with confidence and the belief that I could raise my score. Indeed I did. I answered every question correctly – procuring a perfect score. I think that Jeff was the perfect choice for a student like me. In order to push my score up, I needed someone who was familiar with the test and the various strategies of taking the test. Jeff proved to be extremely knowledgeable of the intricacies of the SAT. On top of his qualifications, Jeff made every session fun and personable – an approach that can be very refreshing in contrast with the large group-session tutoring methods. I truly felt that Jeff cared about how I did on the exam and beyond; he continues to keep in touch with me regarding my college plans. Jeff is a great find: he is extremely qualified, a pleasure to work with, and was a tremendous asset to me. I would recommend him highly. I just wanted to say thanks so much for everything. I’m very happy with my score and I was certainly comfortable when I took the test. Also, I just wanted to tell you what a lovely time I had talking to you; I’m going to miss your conversation. I hope we meet again some time in the future, you were a blast-of-a-tutor and a truly swell guy. Until then, best wishes from my mom and I, and thank you again for all your help, Jeff. Jeff helped me raise my math scores to what I knew they could be. The first time I took the SAT I got a 670 on the math section, after my sessions with Jeff I got an 800 on it and also got a 780 on the math SAT II. I feel the sessions were completely worth it and were the key factor in the 200 point leap from the first time I took the SAT to the second. Got back my SAT score today (drumroll) and ended up with a grand total of 2190! I moved from a 610 in math to a 690, a 720 in critical reading to a 730 and from a 690 in writing to 770, with an 11 on the essay! Thanks for all your help! Jeff prepared me and gave me confidence. He helped me through my struggles patiently and gave me the inside tips to get me into my first choice college. I raised my test scores more than 300 points. Each session was worth every penny and I greatly appreciate all his help. I cannot believe I did that much better on Critical Reading, 650 to 770, and from 620 to 680 in Math. Couldn’t have done it without you, Jeff. Thanks. All of my scores went up on the SATs. I got a 740 on the reading, a 720 on the writing, and a 590 on the math. So, in total I have a 2050. Anyways, thanks for helping me out so much. Hopefully I’ll talk to you soon. Jeff wasn’t boring at all, so I didn’t suffer through SAT prep like my friends did with other tutors. I had fun while learning to master the techniques of the SAT trade. I owe my nearly perfect score to Jeff, and can honestly say that I enjoyed the process. So I got the 2300. So, thanks a bunch. I think I will have a couple more lessons at the end of the summer before the next SAT for that damn critical reading. OK, the good news is that verbal went up to a 760! Thanks so much for all your help! If you ever need more clients and stuff I know a lot of stressed out people. Jeff’s tutoring taught me to be able to tell exactly what a question is asking and see through little tricks. These skills helped me greatly with the writing and critical reading portions of the SAT, and with only 5 weeks of tutoring, I was able to improve my writing score by 80 points and my critical reading score by 100 points. Thank you so much for helping me out with the SAT’s. Your help raised my score 110 points to a 1460 on the SAT (on the old 1600 point scale), and 140 points on my SAT Subject Test in Math. 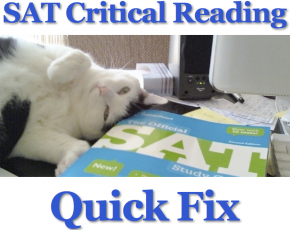 The many practice tests and specific personal advice in regards to test-taking strategies on specific problems and tests in general was extremely helpful. I would definitely recommend your help to other students wanting to raise their scores.